A checked version of this page, approved on 26 September 2015, was based on this revision. The History of al-Tabari is an English translation of The History of the Prophets and Kings (تاريخ الرسلوالملوك Tarikh al-Rusul wa al-Muluk, popularly known as Tarikh al-Tabari). It is an historical and religious chronicle written by the Muslim historian Ibn Jarir al-Tabari (838-923), beginning with the Islamic Creation to the year 915 AD. It forms one of Islam's major religious sources, containing the most complete recension of Ibn Ishaq's Sirat Rasul Allah (the most important biography of Prophet Muhammad, partially forming his Sunnah), and is universally praised by Muslims for its detail and accuracy concerning Muslim and Middle Eastern history. In the ninth century A.C, Islamic learning was at its peak. Muslim scholars and scientists excelled in their learning and achievements in different fields. Abu Jafar Muhammad ibn Jarir at-Tabari surpassed them all. Learned in hadith literature, he also studied many other subjects to further his knowledge of the Holy Qur'an and the religion of Islam. During the end of his days, he was known as a commentator on the Holy Qur'an, an expert in Islamic Jurisprudence (Fiqh), and as a famous historian. Tarikh al-Rusul wa'l muluk 'Annals of the Apostles and Kings' ,by Abu Ja'far Muhammad b Jarir al-Tabri (839-923), is by common consent the most important universal history produced in the world of Islam. It is divided here in 40 Volumes (Including Index) each of which covers about two hundred pages of the original Arabic text. Imam at-Tabari spent 12 years writing this encyclopaedia on Islamic history. His job was not easy for he had to collect and compile the material from different sources. He had to rely on oral reports as well to complete his encyclopedia. His encyclopedia, 'Annals of the Apostles and Kings', chronicled the History of Islam year by year; an attempt to categorize history from creation till the year 915 A.C. By the time he had finished his work, he had gathered all the historical traditions of the Arabs in his voluminous work. The Muslim world was not slow in showing its appreciation, and this work became more famous than his Commentary of the Holy Qur'an, for there was no other works like that in existence at that time. It is reported that there were at least 20 copies of his encyclopedia in all great libraries in the Muslim world of those days. Hundreds of copyists earned their living copying his work for use of individuals and libraries. Many of his original works were lost over the passage of time. It was only in the end of the last century that modern scholars pieced together his work so that it could be studied by students in modern times. 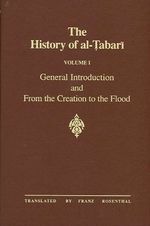 Volume I of the thirty-eight volume translation of Tabari's great History begins with the creation of the world and ends with the time of Noah and the Flood. It not only brings a vast amount of speculation about the early history of mankind into sharp Muslim focus, but it also synchronizes ancient Iranian ideas about the prehistory of mankind with those inspired by the Qur'an and the Bible. The volume is thus an excellent guide to the cosmological views of many of Tabari's contemporaries. The translator, Franz Rosenthal, one of the world's foremost scholars of Arabic, has also written an extensive introduction to the volume that presents all the facts known about Tabari's personal and professional life. Professor Rosenthal's meticulous and original scholarship has yielded a valuable bibliography and chronology of Tabari's writings, both those preserved in manuscript and those alluded to by other authors. The introduction and first volume of the translation of the History form a ground-breaking contribution to Islamic historiography in English and will prove to be an invaluable source of information for those who are interested in Middle Eastern history but are unable to read the basic works in Arabic. This volume records the lives and efforts of some of the prophets preceeding the birth of Mohammad. It devotes most of its message to two towering figures--Abraham, the Friend of God, and his great-grandson, Joseph. The story is not, however simply a repetition of Biblical tales in a slightly altered form, for Tabari sees the ancient pre-Islamic Near East as an area in which the histories of three different peoples are acted out, occasionally meeting and intertwining. Thus ancient Iran, Israel, and Arabia serve as the stages on which actors such as Biwarasb, the semi-legendary Iranian king, Noah and his progeny, and the otherwise unknown Arabian prophets Hud and Salih appear and act. In the pages of this volume we read of the miraculous birth and early life of Abraham, and of his struggle against his father's idolatry. God grants him sons--Ishmael from Hagar and Isaac from Sarah--and the conflicts between the two mothers, the subsequent expulsion of Hagar, and her settling in the vicinity of Mecca, all lead to the story of Abraham's being commanded to build God's sanctuary there. Abraham is tested by God, both by being commanded to sacrifice his son (and here Tabari shows his fairness be presenting the arguments of Muslim scholars as to whether that son was Ishmael or Isaac) and by being given commandments to follow both in personal behavior and in ritual practice. The account of Abraham is interlaced with tales of the cruel tyrant Nimrod, who tried in vain both to burn Abraham in fire and to reach the heavens to fight with God. The story of Abraham's nephew Lot and the wicked people of Sodom also appears here, with the scholars once again arguing--this time over what the exact crimes were for which the Sodomites were destroyed. Before proceeding to the story of Joseph, which is recounted in great detail, we linger over the accounts of two figures associated with ancient Arabia in Muslim tradition: the Biblical Job, who despite his trials and sufferings does not rail against God, and Shu'ayb, usually associated with the Biblical Jethro, the priest of Midian and father-in-law of Moses. Finally we meet Joseph, whose handsome appearance, paternal preference, and subsequent boasting to his brothers lead to his being cast into a pit and ending up as a slave in Egypt. His career is traced in some detail: the attempted seduction by Potiphar's wife, his imprisonment and eventual release after becoming able to interpret dreams, and his rise to power as ruler of Egypt. The volume ends with the moving story of Joseph's reunion with his brothers, the tragi-comic story of how he reveals himself to them, and the final reunion with his aged father who is brought to Egypt to see his son's power and glory. This is proto-history told in fascinating detail, of us in different contexts, as well as of others completely unknown to Western readers. This volume continues the stories of the Israelite patriarchs and prophets who figured in Volume II, as well as of the semi-mythical rulers of ancient Iran. In addition to biblical, Qur'anic, and legendary accounts about Moses, Aaron, and the exodus of the Children of Israel from Egypt; of the Judges, Samuel and Ezekiel; and of Saul, David, and Solomon, it includes a version of Iranian prehistory that emphasizes the role of Manuchihr (Manushihr in Arabic) in creating the Iranian nation and state. Woven into these accounts are stories about figures belonging to the very earliest literatures of the Middle East: the mysterious al-Khidwith echoes from the epic of the Sumero-Akkadian hero Gilgamesh; the legendary exploits of Dhu l-Qarnayn, mirroring the ancient romance of Alexander; and incorporating elements about the encounter of King Solomon and Bilqis, the Queen of Sheba, of Jewish midrash and South Arabian lore. The Islamic empire was at its political and economic height during the tenth and eleventh centuries, and a new civilization was forged at the caliphal court and in society at large. One of the literary triumphs of that civilization was this rich and colorful tapestry belonging to the Islamic genre of "tales of the prophets." The tales in this volume show how threads from all the ancient civilizations of the Middle East were incorporated, absorbed, and Islamized in the brilliant fabric of that new civilization. In this volume Tabari takes up the history of the ancient world, focusing on the Iranians and the Israelites after the time of Solomon. He establishes a comparative chronology between the two nations; viewing Bahman, the Persian king, as the son of Esther, and his daughter, Khumani, the mother of Darius. Tabari's synchronization also leads him into a discussion of North and South Arabia, in which stories about King Jadhimah, Queen Zabba, and the tribes of Tabari and Jadis appear. Falling outside the general scheme of the volume, are other details. These are concentrated in five chapters on the biblical stories of Samson and Delilah, and on Jonah, commentary on a Quranic passage concerning three divine envoys, and on two stories of Christian antiquity, the Seven Sleepers and the martyr Jirjis. Tabari presents a mass of Iranian, Jewish, Christian, and Arabian lore in order to create a unified view of the material. His treatment of the mythical Iranian kings, as they battle Turanians and other foes, extends beyond the time of Alexander and his successors to the era of the Gospels, John the Baptist, and Jesus. Tales of the Israelites include the story of Asa and Zerah the Indian, remarkable for its development of the Biblical nucleus and variants of the history of the destruction of Jerusalem by Nebuchadnezzar. This volume of al-T'abari's History has a particularly wide sweep and interest. It provides the most complete and detailed historical source for the Persian empire of the Sasanids, whose four centuries of rule were one of the most glorious periods in Persia's long history. It also gives information on the history of pre-Islamic Arabs of the Mesopotamian desert fringes and eastern Arabia (in al-Hira and the Ghassanid kingdom), and on the quite separate civilization of South Arabia, the Yemen, otherwise known mainly by inscriptions. It furnishes details of the centuries'-long warfare of the two great empires of Western Asia, the Sasanids and the Byzantine Greeks, a titanic struggle which paved the way for the subsequent rise of the new faith of Islam. The volume is thus of great value for scholars, from Byzantinists to Semitists and Iranists. It provides the first English translation of this key section of al-T'abari's work, one for which non-Arabists have hitherto relied on a partial German translation, meritorious for its time but now 120 years old. This new translation is enriched by a detailed commentary which takes into account up-to-date scholarship. The sixth volume of the translation of al-Tabari's History deals with the ancestors of Muhammad, with his own early life, and then with his prophetic mission up to the time of his Hijrah or emigration to Medina. The topics covered mean that this volume is of great importance both for the career of Muhammad himself and for the early history of Islam. Al-Tabari was familiar with, and made use of, the main early source of these matters, the Sirah or life of Muhammad by Ibn Ishaq, a work which is still extant. Although his own treatment is briefer than that of Iban Ishaq, it complements the latter in important ways by making use of other sources. Where Ibn Ishaq gave only the version of an event which he preferred, al-Tabari includes any variants which he considered of value. Thus he mentions the dispute about the first male to become a muslim--'Ali or Abu Bakr or Zayd--and has also several variant accounts of the call to hostility toward Muhammad from many of the leading Meccans and their attempts to put pressure on his family to stop his preaching. The negotiations with the men of Medina which eventually led to the Hijrah are fully described, and there is then an account of how Muhammad escaped an assassination attempt and arrived safely in Medina. A concluding section discusses some chronological questions. This volume does not merely give a straightforward account of the earlier career of Muhammad and the beginnings of Islam, but also contains valuable source-material not easily accessible otherwise, or not accessible at all. The contents of this volume are extremely significant: The specific events in this earliest period set precedents for what later became established Islamic practice. The book deals with the history of the Islamic community at Medina during the first four years of the Islamic period--a time of critical improtance [sic] for Islam, both as a religion and as a political community. The main events recounted by Tabari are the battles between Muhammad's supporters in Medina and their adversaries in Mecca. Tabari also describes the rivalries and infighting among Muhammad's early supporters, including their early relations with the Jewish community in Medina. This volume covers the history of the Muslim community and the biography of Muhammad in the middle Medinan years. It begins with the unsuccessful last Meccan attack on Medina, known as the battle of the Trench. Events following this battle show the gradual collapse of Meccan resistance to Islam. The next year, when Muhammad set out on pilgrimage to Mecca, the Meccans at first blocked the road, but eventually a ten-year truce was negotiated at al-Hudaybiyah, with Muhammad agreeing to postpone his pilgrimage until the following year. The Treaty of al-Hudaybiyah was followed by a series of Muslim expeditions, climaxing in the important conquest of Khaybar. In the following year Muhammad made the so-called Pilgrimage of Fulfillment unopposed. Al-Tabari's account emphasizes Islam's expanding geographical horizon during this period. Soon after the Treaty of al-Hudaybiyah, Muhammad is said to have sent letters to six foreign rulers inviting them to become Muslims. Another example of this expanding horizon was the unsuccessful expedition to Mu'tah in Jordan. Shortly afterward the Treaty of al-Hudaybiyah broke down, and Muhammad marched on Mecca. The Meccans capitulated, and Muhammad entered the city on his own terms. He treated the city leniently, and most of the Meccan oligarchy swore allegiance to him as Muslims. Two events in the personal life of Muhammad during this period caused controversy in the community. Muhammad fell in love with and married Zaynab bt. Jahsh, the divorced wife of his adopted son Zayd. Because of Muhammad's scruples, the marriage took place only after a Qur'anic revelation permitting believers to marry the divorced wives of their adopted sons. In the Affair of the Lie, accusations against Muhammad's young wife 'A'ishah were exploited by various factions in the community and in Muh'ammad's household. In the end, a Qur'anic revelation proclaimed 'A'ishah's innocence and the culpability of the rumormongers. This volume of al-Tabari's History records the collapse of Meccan resistance to Islam, the triumphant return of Muhammad to his native city, the conversion to Islam of the Meccan oligarchy, and the community's successful weathering of a number of potentially embarrassing events in Muhammad's private life. This volume deals with the last two and a half years of the Prophet's life. In addition to the three major expeditions to Hunanyn, Ta'if, and Tabuk, it describes in detail the circumstances surrounding the illness from which he died and the subsequent crisis of leadership faced by the nascent Muslim community. The author depicts with admirable fairness all the various opinions and divisions that existed within the community. He also presents a vivid picture of the Prophet's physical appearance, his personal life, and his marriages. Among other topics discussed in this volume are all the deputations that came to Medina; a summary of all the expeditions and raiding parties; and his scribes, freedmen, horses, camels, goats, swords, coats of mail, and so on. It also covers the apostasy of Musaylimah, Aswad, and Tulhahah and the Prophet's attempts to deal with them. The translation not only preserves the original lively flavor of al-Tabari but also, in its annotations, draws extensively on both parallel Arabic sources and the intensive research of recent years. Readers who seek a deeper understanding of the Prophet's personality and of the reasons for antagonisms engendered among various factions will find this volume most informative. Although this volume deals with the part of al-Tabari's History covering the years 12 and 13 (633-35), in the caliphates of Abu Bakr al-Siddiq and 'Umar b. al-Khattab, the narratives contained in it, which are lengthy and detailed, are concerned with the first Muslim conquests in Iraq and Syria. Although it might be expected, therefore, that this volume would be a basic source for these conquests, the actual value of the bulk of the reported traditions is in considerable doubt because most of the material is derived from a later Kufan traditionist, Sayf b. 'Umar (d. 170-93/786-809), who apparently exaggerated and distorted his material considerably. Indeed, Sayf's transmissions clearly reveal the tendency of his party, an anti-Shi'ite faction based on the Arab Mudar tribal group in al-Kufah that had lost out with the fall of the Umayyads and the coming of the 'Abbasids to power. Although Sayf's transmissions thus have limited value as far as the earliest conquests themselves are concerned, they are of the utmost value in revealing the content and character of Islamic historical debates in the late 2nd/8th century. In addition, they permit us to elucidate and reconstruct an early harmonizing tendency in Islam that undoubtedly had a significant effect on the way later Muslims viewed their earliest history. The translation is preceded by an introduction analyzing the tendencies of Sayf and his party as revealed in this volume. Extensive notes accompany the text for the benefit of historians in other fields, as well as of Islamic specialists. This volume deals with the aftermath of the decisive battle at al-Qadisiyyah described in the previous volume. First, the conquest of southern Iraq is consolidated; in rapid succession there follow the accounts of the battles at Burs and Babil. Then in 16/637 the Muslim warriors make for the capital al-Mada'in, ancient Ctesiphon, which they conquer after a brief siege. The Persian king seeks refuge in Hulwan, leaving behind most of his riches, which are catalogued in great detail. In the same year the Muslim army deals the withdrawing Persians another crushing blow at the battle of Jalula'. This volume is important in that it describes how the newly conquered territories are at first administered. As the climate of al-Mada'in is felt to be unwholesome, a new city is planned on the Tigris. This is al-Kufah, which is destined to play an important role as the capital city of the fourth caliph, 'Ali. The planning of al-Kufah is set forth in considerable detail, as is the building of its main features--the citadel and the great congregational mosque. After this interlude there follow accounts of the conquests of a string of towns in northern Mesopotamia, which bring the Muslim fighters near the border with al-Jazirah. That region is conquered in 17/638. The history of its conquest is preceded by an account of the Byzantines' siege of the city of Hims. Also in this year, 'Umar is recorded to have made a journey to Syria, from which he is driven back by a sudden outbreak of the plague, the so-called Plague of 'Amawas. The scene then shifts back to southwestern Iran, where a number of cities are taken one after another. The Persian general al-Hurmuzan is captured and sent to Medina. After this, the conquest of Egypt--said to have taken place in 20/641--is recorded. The volume concludes with a lengthy account of the crucial battle at Nihawand of 21/642. Here the Persians receive a blow that breaks their resistance definitively. This volume abounds in sometimes very amusing anecdotes of man-to-man battles, acts of heroism, and bizarre, at times even miraculous events. The narrative style is fast-moving, and the recurrence of similar motifs in the historical expose lends them authenticity. Many of the stories in this volume may have begun as yarns spun around campfires. It is not difficult to visualize an early Islamic storyteller regaling his audience with accounts that ultimately found their way to the file on conquest history collected by Sayf b. 'Umar, al-Tabari's main authority for this volume. The volume begins with the caliphal order to the Muslim troops, recently victorious at the famous battle of Nihawand in 21/641, to penetrate farther into infidel lands in the east. The might of the Persian empire had been broken, and a golden opportunity offered itself to the Muslim community to expand its territories. The territorial gains thus achieved are recounted in this volume. Moving out of the garrison towns of al-Kufah and al-Basrah, the Muslim forces' conquests of Isfahan, Hamadhan, al-Rayy, Qumis, Jurjan, Tabaristan, Azerbaijan, Khurasan, parts of Fars province, Kirman, Sijistan and Makran as far as the Indus, are all described in these pages. Contained in these accounts of far-reaching conquests are the peace documents, which are of considerable historical importance. They are typically the documents issued by the victorious Muslim commanders on the ground to the subjugated local inhabitants, laying out in precise terms the obligations of the latter toward their Muslim conquerors in return for safe conduct. Leaving the Muslim forces on the bank of the Indus, Tabari switches his account to Medina, where in 23/643 'Umar b. al-Khattab was assassinated by a Christian slave. After full accounts of this deed, the reader is provided with details of the caliph's genealogy, his physical description, his birth date and age, the names of his children and wives, and the period of time he was a Muslim. A lengthy section follows, in which the deeds of 'Umar are recounted in anecdotal form. There are also quotations from his addresses to his people and some poetic eulogies addressed to him. The volume ends with 'Umar's appointment of the electoral council, five senior figures in the Islamic community, to decide on his successor, and the fascinating and historically greatly important account of the workings of the council with all the cut and thrust of debate and the politicking behind the scenes. Thus was 'Uthman b. 'Affan appointed to succeed 'Umar. Before the caliphate of the 'Uthman b. 'Affan, the Muslim community had grown from strength to strength in spite of a series of major crises--the Hirah, the death of the Prophet, the Riddah wars, the assassination of 'Umar by a Persian slave. But 'Uthman's reign ended in catastrophe. His inability to manage the social and political conflicts that were now emerging among various factions within the community led to his death at the hands of Muslim rebels. The consequences of this tragic event were bitter: not only a century of civil war, but also political and religious schisms of such depth that they have not been entirely healed even now. Most medieval Muslim historians told this story in an overtly partisan manner, but al-Tabari demands more of his readers. First of all, they must decide for themselves, on the basis of highly ambigous evidence, whether 'Uthman's death was tyrannicide or murder. But, more than that, they must ask how such a thing could have happened at all; what had the Muslims done to bring about the near-destruction of their community? Al-Tabari presents this challenge within a broad framework. For, even while the internal crisis that issued in 'Uthman's death was coming to a head, the wars against Byzantium and Persia continued. The first expeditions into North Africa, the conquest of Cyprus, the momentary destruction of the Byzantine fleet at the Battle of the Masts, the bloody campaigns in Armenia, the Caucasus, and Khurasan are all here, in narratives that shift constantly between hard reporting and pious legend. Muslim forces retain the offensive, but there are no more easy victories; henceforth, suffering and endurance will be the hallmarks of the hero. Most evocative in the light of 'Uthman's fate is the moving account of the murder of the last Sasanian king, Yazdagird III--a man betrayed by his nobles and subjects, but most of all by his own character. This volume of al-Tabari's history deals with the traumatic breakup of the Muslim community following the assassination of the Caliph 'Uthman. It begins with the first seriously contested succession to the caliphate, that of 'Ali, and proceeds inexorably through the rebellion of 'A'ishah, T'alhah, and al-Zubayr, to the Battle of the Camel, the first time Muslim army faced Muslim army. It thus deals with the very first violent response to the two central problems of Muslim history: who is the rightful leader, and which is the true community? It is a section with the weightiest implications for the Muslim interpretation of history, wide open to special pleading. There are the Shi'a who depict 'Ali as a spiritual leader fighting against false accusations and the worldly ambitious. Conversely, there are those who would depict him or his followers in a negative light. There are also the 'Abbasid historians, who, though anti-Umayyad, must balance a reverence for the Prophet's household (ahl al-bayt) with a denunciation of 'Alid antiestablishmentarianism. All these points of view, and more, are represented in al-Tabari's compilation, illustrating the difficulty the Muslim community as a whole has faced in coming to terms with these disastrous events. Many of the events treated in this volume have become part of the historical consciousness of Muslims. The first civil war of Islam, the Fitnah, is widely seen as of decisive importance in dividing the Muslims into three major traditions, Sunnis, Shi'is, and Kharijis, which have persisted until today. Although this division may be an over-simplification of a much more complex process of community formation, the events narrated here are certainly of great importance in the early history of Islam. The volume is focused on the struggle between the caliph 'Ali and his rival and eventual successor as caliph, Mu'awiyah, the first caliph of the Umayyad dynasty. About half of the material is concerned with the confrontation between the two at the battle of Siffin in 657, the fighting, the ending of the battle when the Syrian supporters of Mu'awiyah are described as having attached Qu'ranic texts to their lances, and the subsequent negotiations between the two rivals which resulted in the dispute's being put to arbitration. Much detail is also provided about 'Ali's struggle against the Kharijis, his former supporters who had turned against him as a result of his agreement with Mu'awiyah to accept arbitration; the revolt against 'Ali in regions of Iraq and Persia around the northern edges of the Persian Gulf, which involved Christians, as well as Muslims, Arabs, and such non-Arab groups as Kurds; the events in Egypt that led to the burning of 'Ali's representative there in the skin of a donkey; and the murder of 'Ali by Ibn Muljam, the account of which sometimes reads as if it were a popular story. Al-Tabari's text makes available a wealth of detail in narratives collected from the now lost compilations of scholars of earlier generations. The bulk of the material is cited from the famous Abu Mikhnaf, who died in A.D. 774, but there are also many reports from other traditionists and narrators whose materials would be largely unknown to us if it were not for the work of al-Tabari. The volume contains a number of speeches and letters attributed to the Prophet's son-in-law and cousin 'Ali, including his deathbed speech to his sons, and there is also a version of the document drawn up by 'Ali and Mu'awiyah in which they agreed to appoint arbitrators. The Arabic text of the Leiden edition of al-Tabari has been compared with the more recent Cairo edition and with the substantial parallel passages in such other works as the Waq'at Siffin of al-Mingari and the Sharh Nahj al-Balaghah of Ibn Abi' l-Hadid, as well as other sources, in an attempt to provide a secure text for translation. Individuals and places are identified in the footnotes, further references to sources and secondary literature are provided, and textual problems and historical matters are discussed. The volume contains a bibliography and index. This volume presents for the first time in English Tabari's complete account of the twenty-year long reign of the fifth caliph, Mu'awiyah (661-680). The importance of this account lies partly in Tabari's quotation of major portions of the work of earlier authors, such as Abu Mikhnaf and other eighth-century compilers. It is also significant because Tabari's selection of themes has had a decisive influence on modern interpretations of this period, particularly on the identification of what the important issues were in the works of Henri Lammens and Julius Wellhausen. Here one can read the exciting account of the Khariji revolt of Mustawrid ibn Ullifah, the impressive but controversial record of the governorship of Ziyad b. Abihi, the entertaining escapades of the poet Farazdaq in his youth, and the tragic story of Hibn 'Adi. Tabari's presentation of different points of view about these and other events makes his account an indispensable source for early Islamic history. This volume deals with the caliphate of Yazid. Yazid was not accepted as a legitimate caliph by many of the leading Muslims of the time, and, therefore, al-Tabari has concentrated his account of Yazid's caliphate almost entirely on the opposition to him. This opposition had its leadership in two of the leading Islamic figures of the time, al-Husayn, the son of the caliph 'Ali, and Ibn al-Zubayr, a leading Muslim who felt that he had had some claims to the caliphate himself. The first revolt was led by al-Husayn. This revolt, although ineffectual in military terms, is very important for the history of Islam, as al-Husayn came to be regarded by Shi'ite Muslims as the martyred imam; his martyrdom is still commemorated every year by them. In his account al-Tabari has preserved for us some of the earliest historical writing on the subject. The amount of space he devotes to this event shows the importance it had already assumed by his own time. The second revolt, that of Ibn al-Zubayr, was much more serious in immediate terms. The revolt or civil war can be divided into two stages. This volume covers the first stage, ending with the timely death of Yazid, which saved Ibn al-Zubayr from defeat. This volume covers the vital early years of the second Muslim civil war, when the Umayyad caliphate seemed on the point of extinction. That it survived had much to do with the vigor of the Umayyad Marwan b. al-Hakam whose initial restoration of Umayyad authority is described here in some detail by al-Tabari's sources. In the chaos and confusion of the civil war, however, developments took place that were to prove significant for the future of the Umayyad calphate, indeed for the early history of Islam in general. Among them, the first manifestations of large-scale tribal divisions among the Arabs, together with the development of support for the descendants of the Prophet as the only legitimate rulers, were particularly important and receive special attention. For this period, al-Tabari's History is a fundamental source. The material collected by al-Tabari frequently makes lively and colorful reading, and the annotations that accompany this translation attempt to clarify and make more explicit the sometimes allusive and compressed information provided by al-Tabari and his sources. Since the standard edition of the text was made, at the end of the nineteenth century, a significant number of other sources have been published, which often make possible a more exact reading of al-Tabari's text. For these reasons, it is hoped that this translation will appeal to those interested in the period but who have little or no Arabic and will also prove useful to students and scholars who are capable of reading the Arabic but will appreciate the suggested textual amendments and improvements and the elucidatory comments. Volume XXI of the History of al-Tabari (from the second part of 66/685 to 73/693) covers the resolution of "the Second Civil War." This conflict, which has broken out in 64/683 after the death of the Umayyad caliph Yazid I, involved the rival claims of the Umayyads (centered in Syria) and the Zubayrids (centered in the Hijaz), each of whom claimed the caliphal title, Commander of the Faithful. Both parties contented for control of Iraq, which was also the setting for al-Mukhtar's Schi'ite uprising in al-Kufah during 66/685 and 67/686. Kharijite groups were active in south-western Iran and central Arabia, even threatening the heavily settled lands of Iraq. By the end of 73/692, the Umayyad regime in Damascus, led by Abd-al-Malik, had extinguished the rival caliphate of Ibn al-Zubayr and had reestablished a single, more or less universally acknowledged political authority for the Islamic community. Al-Tabari's account of these years is drawn from such earlier historians as Abu Mikhnaf, al-Mada'ini, and al-Waqidi and includes eyewitness accounts, quotations from poems, and texts of sermons. Notable episodes include al-Mukhtar's slaying of those who had been involved in the death of al-Husayn at Karbala, the death of al-Mukhtar at the hands of Mus'ab b. al-Zubayr, the revolt of Amr b. Sa'id in Damascus, the death of Mus'ab at the Battle of Dayr al-Jathaliq, and al-Hajjaj's siege and conquest of Mecca on behalf of Abd-al-Malik. There are excursuses on the chair that al-Mukhtar venerated as a relic of Ali, the biography of the colorful brigand Ubaydallah b. al-Hurr, and the development of the secretarial office in Islam. This volume chronicles the history of the Islamic state in the years A. H. 74-81 (A. D. 693-701), after the final defeat of Ibn al-Zubayr in Mecca put an end to twelve years of civil war and reunited the empire under the rule of the Marwanid caliph 'Abd al-Malik. Syria and the Hijaz enjoyed a period of relative peace during this time, and stability and consolidation were furthered by such basic administrative reforms as the institution of an official Islamic coinage. Pacification of Iraq, where Kharijite rebel bands still roamed and mutiny was spreading among the government forces, was entrusted by 'Abd al-Malik to the victorious general al-Hajjaj b. Yusuf. Al-Tabari gives a detailed account of this iron-fisted governor's administration, concentrating on his war against the redoubtable Shabib b. Yazid, a Kharijite guerilla leader with a band of a few hundred men who held out against all odds and twice even entered the capital at al-Kufah and prayed in its mosque. Vivid eyewitness reports from participants on both sides of this conflict provide a valuable picture of Arab life in Iraq at this time, as well as evidence for the ideology of the Kharijites and the sources of discontent in the wider society. Attention is also given to developments in the frontier provinces of the east, eventually also placed under the authority of al-Hajjaj. In Khurasan, the vicious tribal feuds that had interrupted the policy of continued conquest were gradually resolved and campaigning resumed. In Sijistan, a crushing defeat of Arab troops led al-Hajjaj to outfit the "Peacock Army," a force of unprecedented size and impressiveness, which, when it rebelled under its leader, Ibn al-Ash'ath, was to offer the governor the gravest challenge of his career. This volume covers the years 700-715 A.D., a period that witnessed the last five years of the caliphate of the Umayyad 'Abd al-Malik b. Marwan and the whole of the caliphate of his son al-Walid. In retrospect, this period can be seen to have marked the apogee of Marwanid Umayyad power. It began with the dangerous revolt of the Iraqi tribal leader Ibn al-Ash'ath, which seriously imperilled Marwanid control of Iraq and was countered with considerable difficulty; but this proved to be the last of the obstacles faced by 'Abd al-Malik in the wake of the Second Civil War of 685-693. Thereafter he was able to preside over a strong and dynamic Arab kingdom, with al-Hajjaj b. Yusuf as his powerful governor of Iraq and the East. When 'Abd al-Malik died in 705, the caliphate passed to his son al-Walid, during whose decade of office al-Hajjaj remained at his post and further Arab expansion took place in Central Asia, in Sind, and in the Iberian Peninsula. To many of their contemporaries, the Arabs of that time must have looked like potential world conquerors. The volume ends shortly after the deaths of al-Hajjaj and al-Walid and just two years before the dispatch in 717 of the ill-fated Arab expedition to Constantinople. In this volume, which covers the caliphates of Sulayman, 'Umar II, and Yazid II, al-Tabari provides vivid and detailed accounts of the events spanning the period from 97-105/715-724. We listen to the stirring speeches of Qutaybah b. Muslim, in which he urges his followers to renounce their allegiance to Sulayman; are present at the disastrous third and final attempt to take Constantinople; watch from behind the scenes as Raja'b. Haywah skillfully engineers the accession of 'Umar II; and follow the remarkable career of Yazid b. al-Muhallab, first as governor and conqueror, then as prisoner, and finally as rebel. Throughout this volume we observe the struggle of the Umayyad regime to maintain control over a rapidly expanding but increasingly dissatisfied subject population. Governors are appointed and dismissed with dizzying rapidity, administrative boundaries are drawn and redrawn, Arab tribesmen express dissatisfaction with the diminishing rewards of military conquest, non-Arab converts chafe at the differential treatment they receive, and religious opponents revolt in the name of "the Book and the Sunnah." Important in their own right, the events of this period provide an essential key to a proper understanding of the 'Abbasid revolution that lay just over the horizon. This volume deals with the part of Tabari's great History covering the first fifteen years of the caliphate of the Umayyad Hisham b. 'Abd al-Malik, which represents almost the last period of universal political unity in Islamic history. Tabari's work is generally recognized as among the most important sources for Hisham's reign. Here the bitter fighting faced by the Muslim forces on the frontiers receives extensive and graphic coverage. In particular, the unrewarding and continous war against the pagan Turks in Khurasan, a struggle that did so much to alienate the troops and thus to spread disaffection with Umayyad rule, is recorded in much more detail than elsewhere. Military disasters such as the Day of Thirst, the Day of Kamarjah, and the Day of the Defile are vividly portrayed. Tabari also devotes considerable attention to the growing internal problems that clouded the latter days of Hisham's rule, including the persistent contest for power between the great tribal groupings and the struggle of non-Arab Muslims for better status for themselves in the Islamic state. The burgeoning fiscal difficulties that threatened the state under Hisham are also highlighted. Additionally, there are many reports of the easliest 'Abbasid revolutionary activity. This volume is not only essential for the study of the reign of Hisham but also for understanding the background of the Umayyads' downfall and the establishment of 'Abbasid rule, laying bare some of the roots of the final breakdown of Islmaic political unity. The years 738-745/121-127, which this volume covers, saw the outbreak in Syria of savage internecine struggles between prominent members of the Umayyad family, which had ruled the Islamic world since 661/41. After the death of the caliph Hisham in 743-/125, the process of decay at the center of the Umayyad power--the ruling family itself--was swift and devastating. Three Umayyad caliphs (al-Walid II, Yazid III, and Ibrahim) followed Hisham within little more than a year, and the subsequent intervention of their distant cousin Marwan b. Muhammad (the future Marwan II) could not arrest the forces of opposition that were shortly to culminate in the 'Abbasid Revolution of 750/132. In this volume al-Tabari deals extensively with the end of Hisham's reign, providing a rich store of anecdotes on this most able of Umayyad caliphs. He also covers in depth the notorious lifestyle of al-Walid II, the libertine prince and poet, whose career has attracted much scholarly attention in recent years. Moreover, al-Tabari chronicles at great length the events of the rebellion and death of the Shi'ite pretender, Zayd b. 'Ali, at al-Kufah, as well as recording in detail the activities farther to the east, where Nasb. Sayyar was serving as the last Umayyad governor of Transoxiana and Khurasan, the very area from which the 'Abbasid Revolution was to spring. The text also contains several official letters which shed much light on Umayyad propaganda and on early Islamic epistolary style. The hindsight conferred by subsequent centuries highlights the full significance of these half-dozen years or so. Al-Tabari documents the incubation of the 'Abbasid Revolution, an event of great importance in world history, and traces the failure of the principal Shi'ite revolt of the eighth century, a debacle which was also to have serious repercussions, for it generated the foundation of Zaydi principalities in Iran and the Yemen. Yet even these major themes are secondary to the epic tale that al-Tabari unfolds of the tragic downfall of the first dynasty in Islam. By 735 an Arab empire stretched from Arles and Avignon in southern France to the Indus River and Central Asia, and a vital young civilization fostered by a new world religion was taking root. Yet the Muslim conquerors were divided by tribal quarrels, tensions among new converts, and religious revolts. In 745 a vigorous new successor to the Prophet took control in Damascus and began to restore the waning power of the Umayyad dynasty. Marwan II's attempts were thwarted, however, by revolts on every hand, even among his own relatives. The main body of dissidents was a well-trained group of revolutionaries in Khurasan, led by the remarkable Abu Muslim. By 748 they had seized control of the province and drive the governor, Nasr b. Sayyar al-Laythi, to his death and were advancing westward. This volume tells of the end of the Umayyad caliphate, the Abbasid Revolution, and the establishment of the new dynasty. The initial years (126-145) of al-Mansur's reign presented several significant challenges to nascent Abbasid hegemony, and the resulting confrontations constitute the central focus of this section of Tabari's Tarikh. After Abu Jafar succeeded his brother Abu al-Abbas as caliph, the second of the Abbasid dynasty, he moved against his recalcitrant uncle, Abdallah b. Ali, and against the potential threat that he perceived in the person of the commander in Khurasan, Abu Muslim. Eliminating the latter and containing the former freed the caliph to address a series of other onslaughts and insurrections. Starting with the year 144, however, Tabari turned to this volume's principal preoccupation, to which half of the book is devoted. Judging by the attention given to it, he clearly perceived the Hasanid rebellions of Muhammad b. Abdallah (the Pure Soul) and of his brother Ibrahim to be the most substantial attack on Abbasid authority to arise in the first years of that dynasty. Tabari's description of the prolonged search for Muhammad and Ibrahim and of the caliphal vengeance visited upon their father and family provides an extended prelude to the vivid battle and death scenes in Medina and Bakhamra. Yet, elaboration of these events does not eclipse mention of all other Abbasid activity. To bridge the account of Muhammad's defeat and that of Ibrahim's uprising, Tabari inserted a narrative interlude depicting the site selection and preliminary construction of al-Mansur's most celebrated achievement, the City of Peace, Baghdad. This volume opens when the caliph al-Mansur has just defeated the rebellion of Muhammad the Pure Soul in 145/762-3 and is now securely established in power. The main concerns of the remaining thirteen years of his reign are the building of his new capital at Baghdad, on which al-Tabari's text contains details not previously published in English, and his efforts to have his nephew 'Isa b. Musa replaced as heir apparent by his own son Muhammad al-Mahdi, a maneuver that required all his political skills. The circumstances of al-Mansur's death in 158/775 are described in vivid detail, and this section is followed by a series of anecdotes, some serious, some humorous, most vivid and lively, that illustrate his character and habits. The last section of the volume describes the reign of al-Mahdi, more pious than his father but also more liberal and open-handed. Along with routine administration, space is devoted to the bizarre intrigues that accompanied the rise and fall of the vizier Ya'qub b. Dawud and the mysterious circumstances of the caliph's own death in 169/785, followed by a short collection of character stories. In addition, the volume also contains important information about warfare on the Byzantine frontier and in Khurasan. This volume of al-Tabari's History covers nearly a quarter of a century, and after covering the very brief caliphate of al-Hadi, concentrates on that of Harun al-Rashid. During these years, the caliphate was in a state of balance with its external foes; the great enemy, Christian Byzantium, was regarded with respect by the Muslims, and the two great powers of the Near East treated each other essentially as equals, while the Caucasian and Central Asian frontiers were held against pressure from the Turkish peoples of Inner Eurasia. The main stresses were internal, including Shi'ite risings on behalf of the excluded house of 'Ali, and revolts by the radical equalitarian Kharijites; but none of these was serious enough to affect the basic stability of the caliphate. Harun al-Rashid's caliphate has acquired in the West, under the influence of a misleading picture from the Arabian Nights, a glowing image as a golden age of Islamic culture and letters stemming from the Caliph's patronage of the exponents of these arts and sciences. In light of the picture of the Caliph which emerges from al-Tabari's pages, however, this image seems to be distinctly exaggerated. Al-Rashid himself does not exhibit any notable signs of administrative competence, military leadership or intellectual interests beyond those which convention demanded of a ruler. For much of his reign, he left the business of government to the capable viziers of the Barmakid family--the account of whose spectacular fall from power forms one of the most dramatic features of al-Tabari's narratives here--and his decision to divide the Islamic empire after his death between his sons was to lead subsequently to a disastrous civil war. Nevertheless, al-Tabari's story is full of interesting sidelights on the lives of those involved in the court circle of the time and on the motivations which impelled medieval Muslims to seek precarious careers there. The focus of this section is a single event, the civil war between al-Amin and his half-brother al-Ma'mun. Before his death, al-Rashid had arranged for the succession in a series of documents signed at Mecca and deposited for safekeeping in the Ka'bah. Al-Amin was to become caliph; al-Ma'mun was to govern Khurasan with virtual autonomy from Baghdad. Al-Amin could neither remove his brother from office nor interfere with his revenues or military support. Furthermore, al-Ma'mun was named as al-Amin's successor, and al-Amin was forbidden to alter the succession. If either brother violated these conditions, he was to forfeit his rights. It soon became apparent that the good will to carry out these arrangements did not exist. Disagreement broke out when al-Amin insisted that many of the forces that had accompanied al-Rashid and al-Ma'mun to Khurasan return to Baghdad. When the majority of army commanders obeyed the new caliph's orders, al-Ma'mun was enraged and countered with measures to secure his position. Angry letters were exchanged, with al-Amin pressing his brother to make concessions that al-Ma'mun regarded as contrary to the succession agreement. By March 811, military conflict was imminent. Al-Amin demanded that certain border districts be returned to the control of Baghdad. When al-Ma'mun refused, al-Amin despatched an expedition to seize the districts. Al-Amin's resort to force ended in disaster. Al-Ma'mun's forces, led by Tahir b. al-Husayn and Harthamah b. A'yan, quickly closed in on Baghdad. In a siege lasting over a year, Baghdad suffered extensive damage from the fighting and from bombardment by siege engines. Gangs of vagrants and paupers, organized by al-Amin into irregular units, fought a kind of urban guerrilla war. But, with Tahir and Harthamah enforcing the siege and with most of al-Amin's associates having switched their loyalties to the winning side, the caliph was forced to sue for terms. These were worked out among representatives of al-Amin, Tahir, and Harthamah. However, when the caliph boarded the boat that was to take him into Harthamah's custody, troops loyal to Tahir assaulted and capsized the boat. Al-Amin fell into the Tigris, was apprehended, and was executed that night on orders from Tahir. Thus ended this phase of the civil war. Al-Ma'mun was now caliph. Al-Tabari's history of these years includes accounts by participants in the event, diplomatic letters between al-Amin and al-Ma'mun, Tahir's long letter to al-Ma'mun on the circumstances of al-Amin's death, and a dramatic eyewitness account of al-Amin's last hours. Also noteworthy is a 135-verse poem describing the devastation of Baghdad. The section ends with a series of literary anecdotes on the character of al-Amin. The 20 years' caliphate of al-Ma'mum began as a stormy period in Middle Eastern history; after the comparatively peaceful reign of his father Harun al-Rashid, the caliphate was plunged into violent civil warfare in both Iraq and Arabia, involving the sons of al-Rashid, rivals for the supreme authority, and various other sectarian rebels and aspirants for power. Yet once peace was secured and the caliphate lands united once more, al-Ma'mum's reign settled down into one of the most exciting and innovative of the mediaeval caliphate. The Caliph himself was a highly cultivated man who possessed a keen intellectual curiosity and who interested himself in the practical sciences, astronomy and mathematics. He also encouraged the translating of Greek philosophical, scientific and medical works from Greek and Syriac into Arabic and involved himself in theological controversies in which the dialectical techniques of the Greek thinkers were to figure. Tabari's history of this period constitutes a prime source for political and military history. His racy and vivid style, including many verbatim conversations and documents, brings the Caliphate of al-Ma'mum very much alive. Three caliphs are portrayed in this volume: al-Mu'tasim's son and successor, al-Wathiq; al-Wathiq's brother al-Mutawakkil; and al-Mutawakkil's son al-Muntasir. At this time the 'Abbasid caliphs came under the dominant influence of the Turkish military elite. The crowning example of Turkish power and 'Abbasid frailty was the dramatic assassination of al-Mutawakkil by Turkish officers within the precincts of his own palace. The Turks were afterward not only instrumental in raising al-Muntasir the caliphate, they also forced him to depose his two brothers as heirs apparent. Finally, they had al-Muntasir himself killed. During the period of al-Wathiq and al-Mutawakkil, insurrections erupted in the center of the empire, and serious revolts broke out in distant provinces, including Africa and Armenia. The Byzantine raids on Damietta and Samosata were memorable events, and periodic Muslim forays were made into Byzantine territory. Prisoner exchanges between Muslims and Byzantines are reported in engaging detail on the basis of eyewitness testimony. The report of a prisoner release by a Shi'ite emissary to the Byzantine emperor contains a charming description of his visit to Constantinople and his audience with Michael III. The period covered in this volume is one of the most tumultuous periods of Islamic history. In it, al-Tabari details with great success the intricate events that shaped real political power in Samarra and Baghdad during the middle of the ninth century, laying bare the dynamics through which the army generals--who were mainly of Central Asian Turkish extraction--consolidated their grip on the caliphate. The political maneuvering that enabled them to pass the reins of real power to their descendants, creating a dynasty parallel to the "legitimate" caliphal dynasty, is also clearly revealed. The present volume of al-Tabari's monumental history covers the years 255-265/869-878, the first half of the reign of the Abbasid caliph al-Mu'tamid in Samarra. Although the decade was one of relative calm in the capital, compared with the anarchy of the years immediately preceding, danger signals were flashing in territories adjacent to the imperial heartlands. Chief among them was the revolt of the Zanj, the narrative of which occupies the bulk of the present volume. A people of semi-servile status, the Zanj, who were based in the marshlands of southern Iraq, were led by a somewhat shadowy and mysterious figure claiming Shi'ite descent, 'Ali b. Muhammad. Their prolonged revolt against the central authorities was not crushed until 269/882. Al-Tabari's account of these momentous events is unique in both the quality and the quantity of his information. He himself was present in Baghdad during the years of the revolt, and he was thus able to construct his story from reports by numerous eyewitnesses. The result is a detailed narrative that brings alive for the modern reader the main personalities and engagements of the revolt. This volume of Tabari's annals deals almost exclusively with the final stages of the Zanj revolt, the most serious external challenge faced by the central authorities in the last half of the third/ninth century. The rebellion, which began as an 'Alid uprising, but soon gave way to Kharijite influences, was a movement that attracted the disenfranchised elements of society in lower Iraq. Their battle against the tested armies of the Caliphate continued over three decades. And while the Zanj were never able to translate their localized successes into any decisive victory, they caused widespread chaos and great concern for those who had a vested interest in political and economic stability. In many respects, the Zanj resemble modern revolutionary movements that live off the countryside, and harass the authorities. They emerged occasionally for conventional battles, but, more often than not they resorted to unconventional warfare, taking advantage of the extremely difficult terrain in the marshy areas of the region that gave rise to them. To defeat them, the government armies had to improvise new tactics and a strategy based on the lessons of early defeats. Completed in 1999 by a distinguished group of Arabists and historians of Islam, the annotated translation of al-Tabari’s History is arguably the most celebrated chronicle produced in the Islamic lands on the history of the world and the early centuries of Islam. This fortieth volume, the Index, compiled by Alex V. Popovkin under the supervision of Everett K. Rowson, serves as an essential reference tool. It offers scholars and general readers convenient access to the wealth of information provided by this massive work. The Index comprises not only all names of persons and places mentioned by al-Tabari, with abundant cross-referencing, but also a very broad range of subject entries, on everything from “pomegranates” to forms of “punishment.” The volume includes a separate index of Quranic citations and allusions, as well as a list of errata and corrigenda to the entire translation. Alex V. Popovkin is a professional indexer and Everett K. Rowson is Associate Professor of Middle Eastern Studies at New York University. ↑ According to Islamic scholar Fred Donner at the University of Chicago, the material in ibn Hisham's and al-Tabari's recensions are "virtually the same" (Ref: Donner, Fred McGraw (1998). Narratives of Islamic origins: the beginnings of Islamic historical writing. Darwin Press. p. 132. ISBN 978-0-87850-127-4). However, some material found in al-Tabari are not preserved by ibn Hisham. For example, al-Tabari includes the episode of the Satanic Verses, while ibn Hisham does not (Ref: Raven, Wim, Sīra and the Qurʾān – Ibn Isḥāq and his editors, Encyclopaedia of the Qur'an. Ed. Jane Dammen McAuliffe. Vol. 5. Leiden, The Netherlands: Brill Academic Publishers, 2006. p29-51. )(Ref: Cf., Ibn Ishaq [Guillaume's reconstruction, at 165-167] and al-Tabari [SUNY edition, at VI: 107-112]). ↑ History of al-Tabari 40 Vol. Taken from "Abu Jafar Muhammad ibn Jarir at-Tabari". Written by A.I. Makki and originally published by the Muslim Writers Society on April 9, 2004. This page was last edited on 26 September 2015, at 09:36.